I have recently been experimenting more with Linux (Ubuntu distribution) and have recently discovered the power of running Virtual Machines. I started investigating after it was suggested that the safest way to run Windows was inside a Virtual Machine running on Linux, as this helps to stop and contain viruses and Trojans. However, virtual boxes have many other advantages, such as testing different operating systems, different software in the same operating systems, or just keeping your most sensitive data totally separate from general use. Whether to run multiple OS’s for website testing, for increased security, or to run software dependent on OS without having 100 computers, everyone needs a VM or two running on their PC. So, how is it done? By far the easiest method is to install VirtualBox OSE in Ubuntu (a popular windows friendly Linux distribution). VirtualBox OSE can be installed using Ubuntu’s Synaptic Package Manager, which simply means, no command line required for the installation. You will need the command line to set it up, but just one line required. One it is set up, you simple create a new virtual machine, then chose what you are installing. 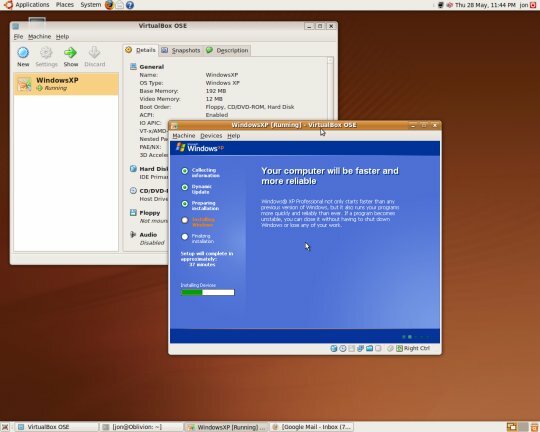 All Windows are available from 3.1 to Windows 7, plus many Linux distributions (Red Hat, Fedora, openSUSE, Debian, Xandros etc), Solaris (and OpenSolaris), BSD (OpenBSD, FreeBSD and NetBSD), IBM OS/2 (Warps, eComStation) plus a few others. All you have to do is simply name your new Virtual Machine, chose which system, specify some resources (RAM, HDD space etc) and then chose to install from disk (obviously need to purchase or download and create an ISO image first). For testing multiple browsers, you can simply set up several virtual machines running the same OS but with different versions of each browser. As the only software each OS install will be the web browser (or browsers) they will not take up too much space. And you can view them all at once in their separate windows on Ubuntu Linux. Where NAME is your user name. I have successfully installed both Vista and XP. XP is essential for me as very often CSS Floats fail in IE6, so having access to various Internet Explorer versions is important. Vista was more of an experiment really, to prove that it could be done. Obviously the main advantage is that you can test and use multiple operating systems without having to duel boot, and run several computers, which is a drain on electricity! Another advantage is running old software which is incompatible with newer operating systems. Last night I attempted to install an old version of Nero, Nero 6, on Vista, but it failed to install. However it works fine on my XP virtual machine in Ubuntu. Also I am running Photoshop 6 (now years out of date) on an Ubuntu computer, which is handy for editing photos for web work while working on the main pc. There are countless other reasons to set up some virtual machines. Testing new software, testing upgrades to software or operating systems, or just experimenting and learning about computers. I am tempted to install Windows 3.1, as a recent conversation regarding Microsoft led me to realise that I know nothing about how they grew their business, and what their software was like in its early days. To be able to play about with early Windows operating systems is also a great learning tool. VM is great. I have many that I use to learn a new OS and to follow along with a client who is having a problem via phone. I have also used VMware in Ubuntu as I can run OSX in that. All work well over a thin client. It is interesting to infect a virtual machine and see what gets changed by the malware. Plus the satisfaction of deleting that VM when done playing. I am now setting up a base install of Jaunty that I am leaving as it comes except for installing virtualbox. I plan on running everything from virtual machines so as not to corrupt my base install.